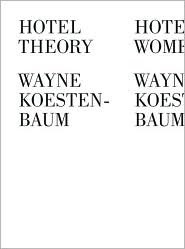 Wayne Koestenbaum's Hotel Theory is a book that marries two narratives in one. The first is a semantic discussion of hotels and the second a fictional account entitled Hotel Women in which some of the characters are Lana Turner and Liberace. What makes this book unique is the way it manages to marry the fiction and nonfiction. Koestenbaum genders the hotel space and the characters he features in a contextually entertaining way. Definitely a good read. And those of you interested in literary theory and depictions of urban concepts in literature, Hotel Theory will be most enjoyable. where fiction and nonfiction meet: this is hot in lit theory now, yes?